The title says it all. Pandas need to get around too you know. This lunch was made possible by an awesome bloggy friend :) Thank you! Love those cutters, and love those pandas!!!! Yippee!! Such cute little cutouts with the pandas! I've been seeing all sorts of new little picks in everyone's bento....looks like I need to do some new supply shopping! That is so sweet, where did you get the panda picks? Faith would love those (who am I kidding, so would I!)! 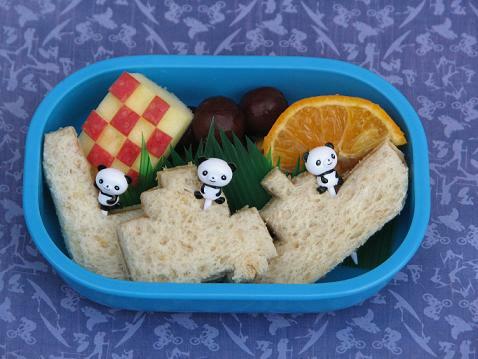 Joining the panda parade--they add such a great sense of fun to this cool little bento!